CEREC is a revolutionary system that enables your dentist to design, fabricate and fit a new crown, veneer, onlay or inlay in a single visit. Usually, these procedures would take multiple appointments, but thanks to Dr Ron’s expertise and the advanced technology available to us, we can now complete these procedures on-the-spot. 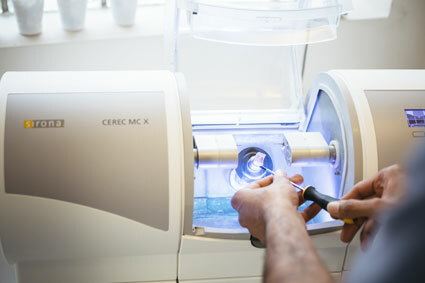 CEREC stands for Ceramic Reconstruction. 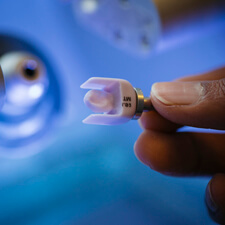 It allows us to take a digital image of your teeth using a special camera, which can then be converted into a 3D computerised model of your tooth. Instead of using gooey impressions to make a mould of your tooth, we can use this digital model instead, which then helps our dentist to design your new restoration. Once Dr Ron is happy with the newly designed tooth, this data is sent to an on-site milling machine, which fabricates your new tooth from a high-quality ceramic block. The ceramic blocks come in a wide variety of shades and colours and our dentist will match this to the colour of your natural, surrounding teeth. The milling process can take anywhere between 6 and 30 minutes, depending on the complexity of the restoration being created. Once milling has finished, Dr Ron will finalise your restoration by staining it, polishing it, or glazing it in a furnace to get it looking just right. Your restoration will then be fitted to your prepared tooth or teeth. Thanks to advanced technology such as CEREC, our oral health care professionals can make precise restorations that look excellent, fit perfectly, and last a long time. Instead of asking you to come back for multiple appointments, we can complete your restoration on-the-spot within just one appointment. Since we complete the entire procedure within the hour, you also only need to have one set of numbing injections, helping our patients to feel more at ease. Additionally, there’s no need for temporary restorations. Simply walk out of your appointment with your permanent restoration in place. That’s the CEREC difference. To schedule a consultation with our friendly team, please call (03) 9568 8911 today. We look forward to helping you and your family on your oral health care journey!